You don't have to prepare every part of every meal ahead of time to meet your goals. Just focusing on protein can be the game changer you've been waiting for! You want to know what bodybuilding really is? I'll tell you in a single word: preparation. Having a strict regimen is part of the game. You develop a training split, structure your sets, and count your reps. Whether you're a student working full-time or bodybuilding is your career, you plan your schedule to ensure that you have time to train, get your cardio done, and get enough rest. And of course, you realize soon enough that your nutrition must also support your goals. I had this realization back when I was a fat teenager, and I began honing my approach to meal prep soon after. It took a long time to perfect, but today, I feel confident about everything I do in the kitchen and why I do it. You may not be a pro or have any desire to be one, but if you want to prep your protein in the most efficient, safe, and effective way for your goals, I can help you. While I can't speak for you, I know that for me, changing my body took serious effort. I was fat the first 13 years of my life, and that didn't change until I began to think about every single piece of food I put in my mouth. I took up running and lifting, and poured all sorts of energy into both in hopes I would have the body I always wanted, but I knew my diet needed to be on point if I wanted to see serious results. I still remember sitting in class as a sophomore in high school, ready to chew my hand off waiting for lunch to finally come. It made sense to me that I should start bringing snacks to school: fruit, sandwiches, yogurts, shakes, and anything else I could throw down between classes. I guess you might say that was my first experience with food prep. While chicken is best grilled, fish loves the predictability of the oven. As I grew serious about training, I began to feel a greater need for protein-rich foods. Unfortunately, lunch meat was far from an ideal protein source, so sandwiches went out the window. I began asking my mom to cook a little extra food at dinner so I could take leftovers with me to school the next day. That worked well...for a while. But eventually, I was expected to buy and cook my own food. Here's what really pushed me into it: School lunch was $2.00 at the time, and it would get me a mystery-meat rib sandwich, tater tots, and a chocolate milk. However, if I shopped the sales and bought chicken for $1.99 a pound, I could get almost 100 grams of protein. The choice was crystal clear—although I did love that rib/tot/milk combo. Throughout college, it became even more important to prepare my food in advance, as I spent most of my time either in class or on the road working. In either of those situations, only a few options existed: Eat out, or miss meals. The first option was expensive and far from ideal nutritionally. The second option was also bad, for obvious reasons. Even at that age, I knew that in bodybuilding, you have to nail it 100 percent, day after day. Making my meals in advance was the only logical outcome. Fast forward 16 years, and I'm still prepping my food in advance. Does it require planning and effort? Sure it does. Food prep is a pain. But like anything else, with practice it becomes second nature. Just set aside a couple hours once or twice a week and do it. Sound like too much? Fine. 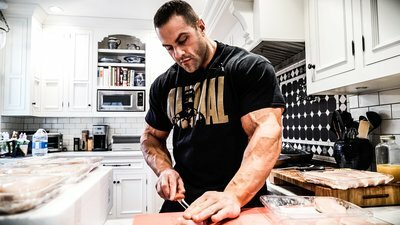 Just prep your protein, like I did in the video. You'll still end up saving yourself a ton of time throughout the week. Keep seasoning simple before cooking. You can add flavor later. Fewer prep sessions means less cleanup: If I prep once per week, I only have to fire up my grill or oven once, clean my kitchen once, and put everything in containers once. I can't imagine doing that every day, let alone for each meal. Protein takes the most time to cook: Popping a potato in the microwave or setting a rice cooker? That's no big deal. But even the simplest protein-prep methods take a little time and effort. Cooking your protein helps prevent spoilage: Carb sources can be stored raw a long time without spoiling. Protein, not so much. You don't want to be cooking protein on an as-needed basis, because that means you're either keeping large amounts of raw product in your fridge, or you're grocery shopping every couple days. Neither scenario makes sense to me. Less shopping, less cooking: I typically go food shopping on a Saturday. I buy 12 pounds of chicken breast and 14 pounds of fresh cod. Then I go home and use the grill for the chicken and the oven for the fish. Why? Chicken tastes better grilled, and fish holds up better under the broiler. Plus, this approach saves time. I can have both the oven and grill going at the same time and knock out the whole ordeal much faster. Preparing the chicken and the cod at the same time just takes a little planning, but I've got my routine down pat. First, I set the grill to medium or medium-high, and the oven to broil for 20 minutes. While they're warming up, I usually get the chicken ready first. I butterfly the breasts to reduce the thickness, allowing the chicken to cook faster and more evenly. Next, I season all of the breasts with oregano and parsley. And that's it. I stay away from premade seasonings for the most part. Over the years, I've used a ton of them. Some give me indigestion, while others just got boring. There's nothing worse than experimenting with a new seasoning on a big batch of food, only realize later that you're not crazy about it. And no one likes to throw food out. So I prefer to prep my food in a relatively plain way. It's crucial to let hot meat cool before putting it in the fridge. Another big advantage of keeping the food simple is that you have more choices with seasonings after you've cooked it. With plain or lightly seasoned grilled chicken breasts, I can add different flavors, like hot sauces, to taste, depending on my mood. Once I butterfly and season the chicken, I lay out the cod filets on baking sheets. Keeping in mind that I will be putting them in smaller containers once cooked, I cut the filets into smaller pieces as needed and based on the size of my containers. Just as I did with the chicken, I season the cod with parsley and oregano only. Oregano tastes great on fish, and parsley, aside from looking pretty and tasting nice, has its own list of health benefits. I also add a light dusting of my favorite Jamaican jerk seasoning. I've used it for years and know that I won't tire of halfway through the batch. Now the meat is ready, the heat is ready, and it's time to cook. Once the fish and chicken are ready, I remove them from the oven or grill and use different techniques to drain the fluid from both as they cool. Note: The last thing you want to do is put hot, moist food in a storage container! Trust me when I tell you it will make for a slimy mess once it's cooled. Plus, you want to let your food cool down before putting it in the refrigerator to avoid raising the temperature of your refrigerator any more than you have to. If you can maintain a steady temperature in your fridge at just above freezing, all of your food will last much longer before spoiling. If it's wintertime and the food has cooled to room temperature, I place it in containers with the lid on and put it outside on my patio to cool before putting in the fridge. This way, there is no disruption in the temperature in the fridge. I'm able to maintain a fairly steady 34 degrees Fahrenheit in my fridge, and I will eat prepared food for up to a full week before discarding any leftovers. If you have big goals in the gym or onstage, you need to take ownership of your meal prep. On a side note, invest in a $10 fridge thermometer. It's worth it. Once all the food is cooked and has cooled, I weigh out appropriate portions and divide it into containers that correspond to my daily intake. Or sometimes, I'll just throw it all in large container and then pull from those on a daily basis as needed. Either way, the main thing is that all the food is prepped and waiting for me when I need it. In the video, because I was traveling to Australia, I vacuum-sealed some of the fish and chicken so it could then be frozen and packed in a cooler that went inside my checked baggage during my travels. Even after a 24-hour flight to Australia, my food was still frozen and ready for me once I arrived. I used to dread food prep. Today, it's more accurate to say that I respect it. It's a vital part of the process, and you avoid it at your own peril. Get systematic, and you can save time and money while ensuring your access to the foods you need. Learn from a pro—and you can grow like one.